What if you could go to jail for something you couldn't change? 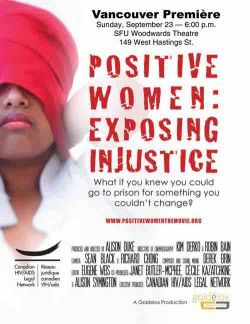 Making its Vancouver debut, Positive Women: Exposing Injustice is a 45-minute documentary film that tells the personal stories of four women living with HIV in Canada—a Quebecker who was charged for not telling her partner that she had HIV at the beginning of an ultimately abusive relationship, a young woman who chose not to pursue charges against the man who infected her, an Aboriginal woman who has personally faced extreme stigma and threats, and a Latina woman who describes the challenges of disclosure and intimate relationships for women living with HIV. Their stories are real, raw and from the heart, and tell the truth about what it’s like to live in a society that all-too-often criminalizes intimate behaviour between consenting adults and discriminates against those living with HIV. Legal experts, doctors, counsellors and support workers also lend their voices to challenge current Canadian laws that are letting down the very women they are meant to protect. A question and answer period will follow the screening, and will include one of the women featured in the film as well as a local Vancouver woman living with HIV. Micheal Vonn of the BC Civil Liberties Association will moderate.